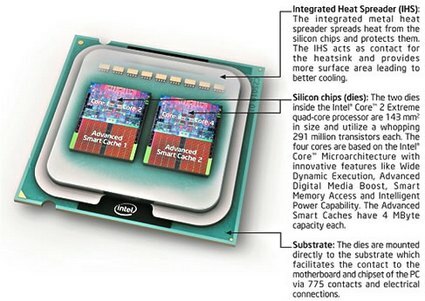 The much awaited quad core offering from Intel called as the Core 2 Quad (Kentsfield core) is officially released by Intel. Core 2 Quad QX6700 is now Intel’s new flagship model which would set you back by USD $9,99 (INR 45,000). 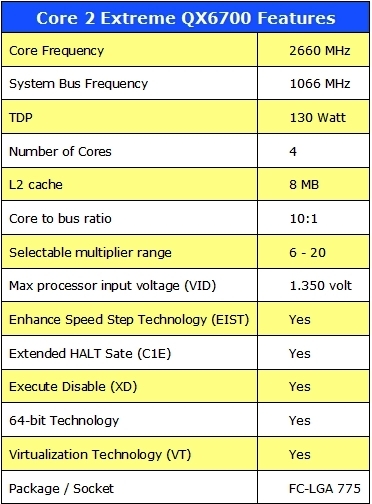 The Core 2 Quad clocks at 2.67 GHz with a 1066 MHz front-side bus and is basically a pair of Conroe dual core chips combined into one package with each chip carrying its own 4MB L2 cache making the total to 8MB. Intel plans to launch a little lower priced kentsfield by Jan 2007 called the Q6600 which is nothing but two Core 2 Duo E6600 combined into one die, but this is expected to cost around USD $851 (INR 38,422). Below you can find some illustrations of Intel Core 2 Quad QX6700 (Kentsfield core). Now that multi core era has begun you would definitely love to read the reviews of Intel Core 2 Quad QX6700 and the upcoming Q6600. You can find lot of reviews for Kentsfield in the internet; I have handpicked few of them which I really considered was worth reading. Though the multi core era has begun but there are very few applications that take real advantage of multi core processors, so even though if you get a quad core processor right now you won’t see any much of a difference at this point of time. If money is not a problem for you then definitely you can buy this as the future of computing is multi core processors so your investment right now won’t go a waste. Let’s welcome multicore computing.